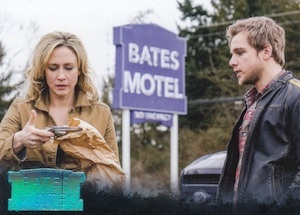 2015 Breygent Bates Motel is the first set of trading cards based on the hit A&E television series. Formatted as a premium factory set, each box includes a full base set and eight hits. 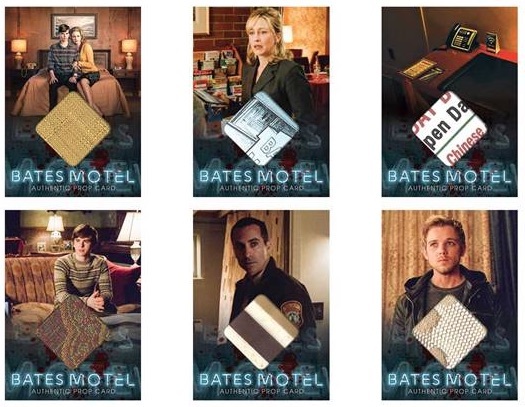 A prequel of sorts (with an updated spin) to Alfred Hitchcock's classic Psycho, the show delves into the world of a young Norman Bates and how he and his mom get into the travel business. 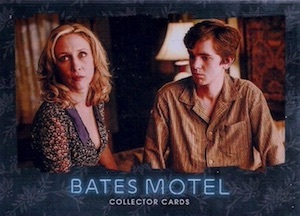 Bates Motel stars Freddie Highmore (Charlie and the Chocolate Factory) as Norman and Vera Farmiga (The Departed) as Norma. 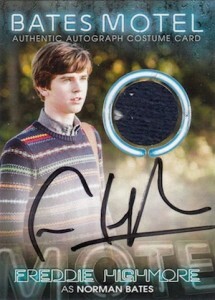 Both are featured among the autograph cards. 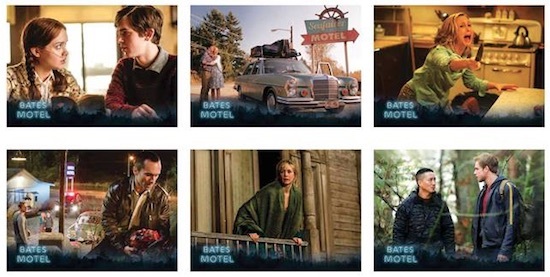 2015 Breygent Bates Motel comes with a 72-card base set. Each factory set includes the entire base set and one parallel card. 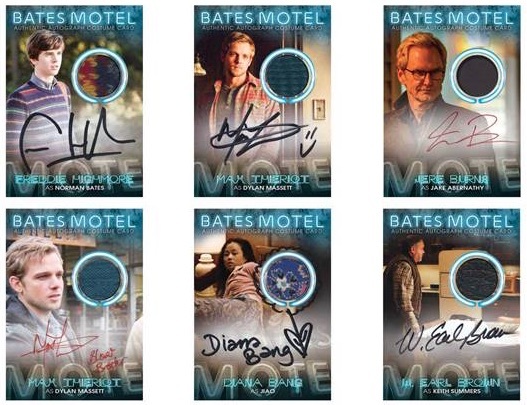 Hit options include autographs and relics from the show. 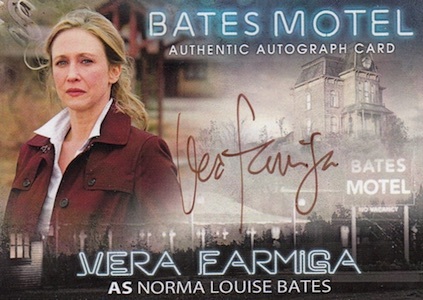 Combining to fall eight per factory box, Autographs (18 cards), Costume Autographs (14 cards) and Prop cards (9 cards) present a detailed assortment. Sketch cards average one per case. 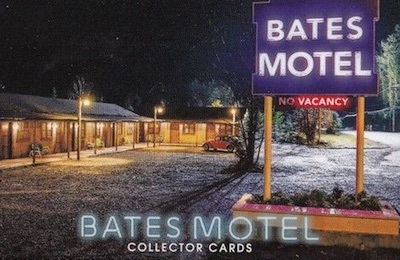 Although it is not issued in a traditional format, there are still special inserts to chase in Breygent Bates Motel. 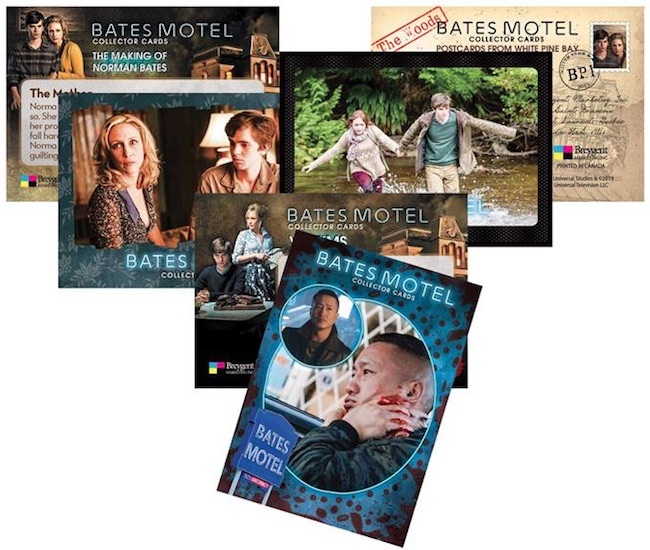 Collectors can find two cards for each of the nine-card sets. 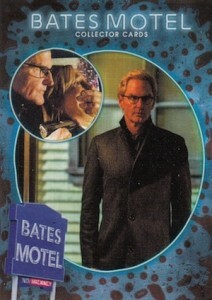 This includes Postcards from White Pine Bay, The Making of Norman Bates and Victims. There is also a special album available that is issued separately and includes two promo cards. The full production run for the release is limited to 99 cases (990 box sets). 72 cards. Shop for full base sets on eBay. 18 cards. Various ink color is used and some subjects have inscriptions. 14 cards. Limited 3.5" x 5" versions for Highmore and Vogel (PR=50) are sold directly on the company website.